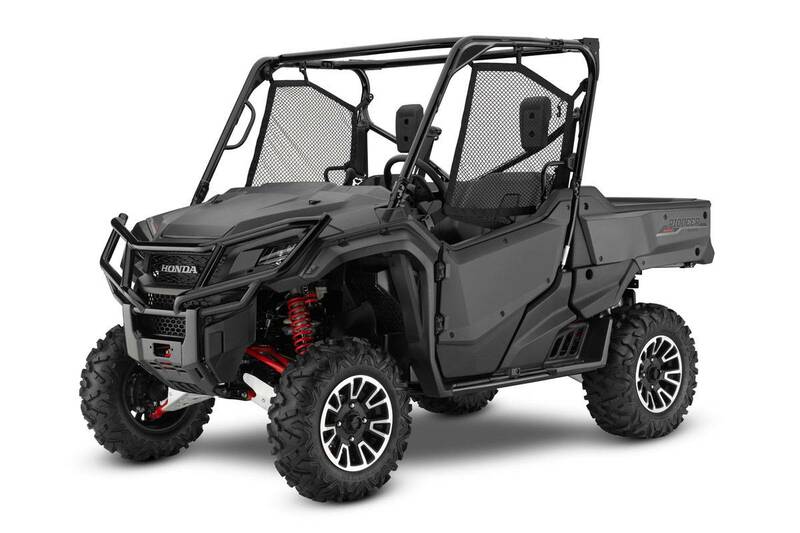 Joining the popular flagship side-by-side range for 2017 is the Pioneer 1000-3 LE which features the new industry first I-4WD system. This intelligent system is a direct result of Honda’s automotive-engineering prowess and offers three great benefits: brake traction control, hill-start assist and electronic brake force distribution. Combined with the Pioneer 1000’s Torque Biasing Limited Slip differential, I-4WD can provide as much tractive force as a locking differential but with reduced steer effort and kick back. The result is excellent traction on a wide range of challenging surfaces, a more relaxed driving experience and no need to stop and engage diff-lock. Fully independent rear suspension and long suspension travel and a memory function that retains the last transmission mode after engaging reverse. Six-speed automatic Dual Clutch Transmission (DCT) and sophisticated Electric Power Steering system (EPS) that reacts to both vehicle speed and steering input, delivering precise driving feedback while also reducing steering effort. This is true even with the front differential locked, as kickback at the steering wheel is reduced in technical terrain. Option for Changing DCT modes on the fly - the driver can override the gear selection at any time when in automatic mode by using the paddle shifters. The selected gear will be maintained for several seconds before the transmission seamlessly reverts to fully automatic shifting. Adjustable FOX QS3 shocks provide an even smoother ride and improved handling; with a simple turn of a dial, customers can tune the machine for different terrains or driving styles. The Pioneer 1000-3 LE has illuminated dash switches for night time use and new cabin storage compartments and cup holders in all four doors. LED headlights and aluminium A-arm guards and a skid plate protect the vehicle against rocks and debris. Designed to excel in off-road use, the engine’s air intake is located up high and under the hood. The new viscous air-filter element helps increase performance and also provides a longer service interval. Seat Belt Interlock is a new system which prompts drivers to wear their seatbelt when operating the Pioneer 1000-3 LE. Fully-Automatic Dual Clutch Transmission (DCT) with six forward gears and reverse; high and low, selectable automatic and manual modes. * Any load limits apply to standard equipment only. Modifying your ATV or SXS, using non-standard equipment, or riding on terrain that is not flat and smooth could further reduce these limits.